The Green Media Group of De La Salle University, in cooperation with the DLSU-Culture & Arts Office, brings back the 12th Indie Un-Film, an Intercollegiate Digital Film Competition. Submit your entries and get a chance to win over Php 30,000 worth of prizes. Submission of entries is from September 1, 2014 to January 13, 2015. Visit http://indieun-film.tumblr.com for more information on the competition, guidelines, and the application form. For any inquiries, don't hesitate to message via their Facebook page, get in touch with them on Twitter (@iufgmg), or contact Rachelle Ong at 0906-569-7174. IUF 2015. Let your stories unfold. 1. The contest is open to legitimate students of school year 2014-2015 from all colleges and universities in Luzon, Visayas, and Mindanao. Joining fee is Php 180 and is non-refundable. NOTE: Graduates may still submit entries, provided that the entry was made during their undergraduate years. 3. All videos must not exceed 20 minutes (including opening and closing credits); otherwise, entry will be disqualified. 4. The entry MUST have a 30-second trailer (in mp4 format) on a separate DVD. 5. Videos that run over-time, have been previously awarded or broadcasted on television, were made by professionals, or contain pornographic elements WILL BE DISQUALIFIED. NOTE: If an entry has been submitted to another competition but has not won an award at the time of submission in IUF, said entry is still qualified. 6. Music videos must contain an original song from the artist or must acquire the consent of the artist to use the song in the music video. 7. Videos must be submitted both in NTSC AVI and DVD FORMAT. Other formats like Mini DVs and V8 WILL NOT be accepted. 8. Entries must be made within the span of January 1, 2014 to January 1, 2015. Videos made on or before December 31, 2013 will NOT be accepted. 9. Interested applicants may visit the website to download the application form. NOTE: One application form must be submitted per video. NOTE: In total, 2 CDs and 2 DVDs must be submitted. 11. 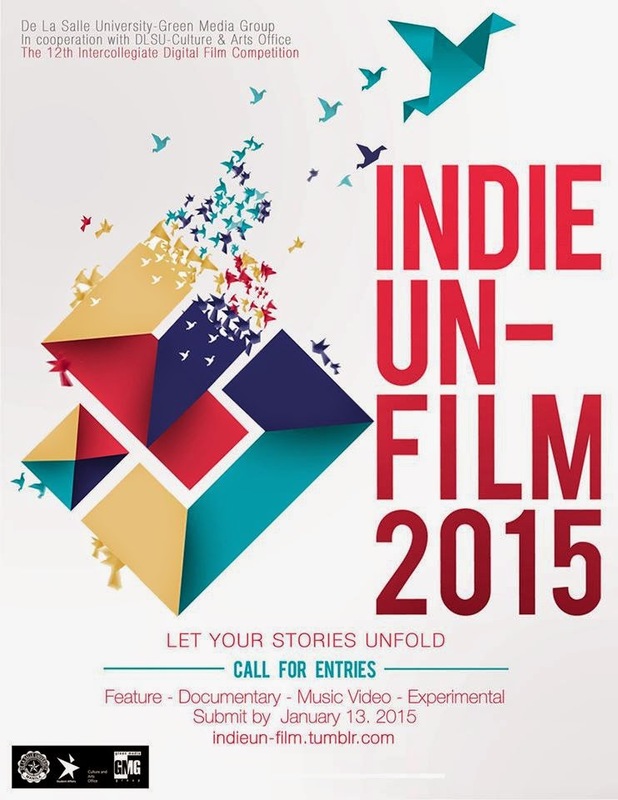 All applicants should email indieunfilm@gmail.com to inform that an entry has been submitted. 12. In the event that only 1 video entry will qualify in a category, the entry will automatically be declared as the winner; however, the participant will only receive half of the cash prize. 13. All entries will be filtered by the organizers along with selected judges and only the top 5 videos for Feature and Documentary category, and the top 3 videos for Music Video and Experimental will qualify for the awards and be shown on the screening. 14. All entries will be used only for this event/competition. 15. Decisions of judges are final with respect to all matters relating to the IUF 2015 Film Competition. 16. SUBMISSION PERIOD OF ENTRIES IS FROM SEPTEMBER 1, 2014 TO JANUARY 13, 2015. 17. Entries should be submitted directly to Room 403, Bro. Connon Hall, De La Salle University, Manila. LATE ENTRIES WILL NOT BE ACCEPTED. 18. Finalists will be notified not later than JANUARY 21, 2015 through text and email. Finalists are welcome to attend the screening from February 5-6, 2015. Awarding of winners will take place on the night of February 6, 2015. Finalists will be given 5 complimentary tickets each.